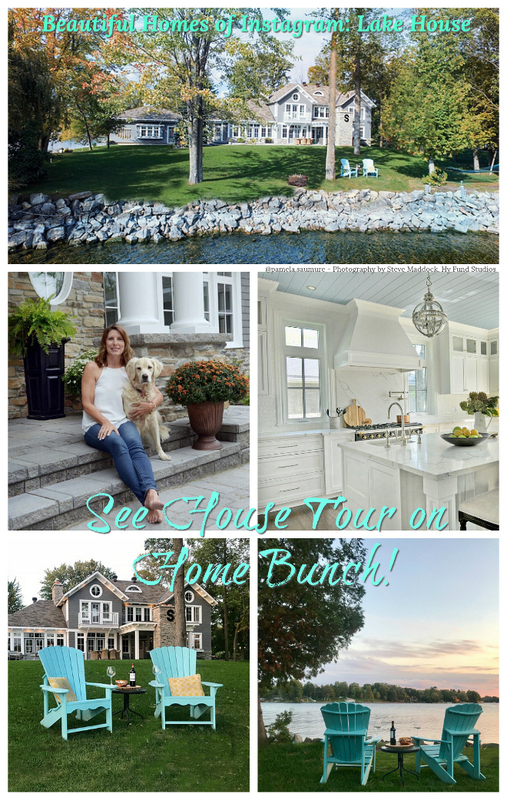 Make sure to pin, save and share this beautiful home. I hope you feel inspired! Body Paint- Benjamin Moore Olympic Mountain. Cedar Stain- Benjamin Moore Hidden Valley. 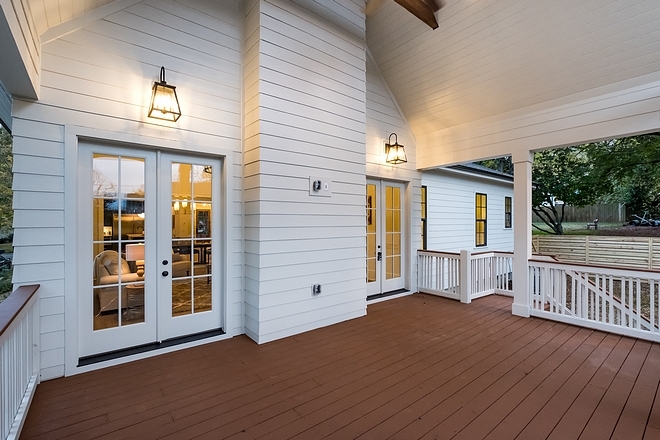 As you can see, you walk into the front entry of this home and immediately see the kitchen. What better first impression could there be? 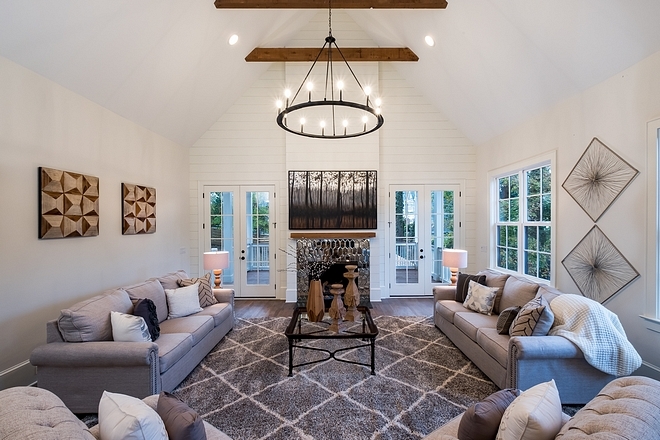 White Oak Floors are throughout this farmhouse style abode, and finished in an eco-friendly Rubio Monocoat plant-based wax product (similar here). 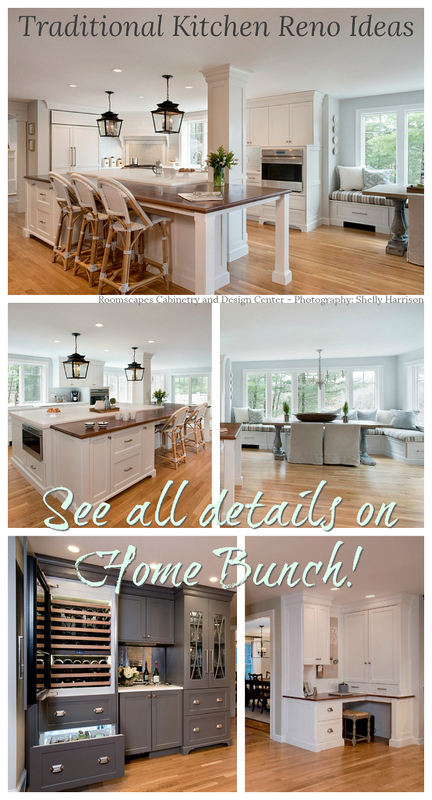 There is more than enough cabinet space as well! Faucet- Brizo Litze in Matte Black with Brilliance Luxe Gold. The center island comfortably seats 4, perfect for casual dining. 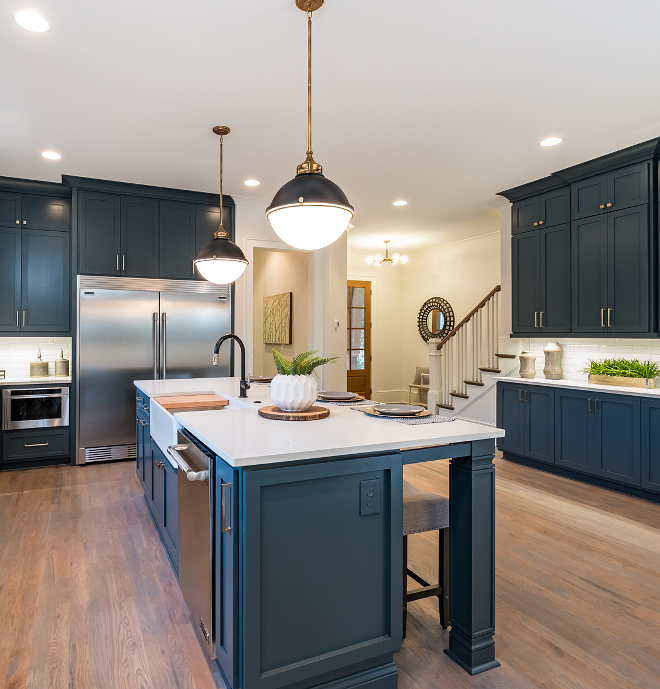 A designer faucet catches your eye as you glance upon this stylish kitchen. Note the picture frame tile accent above the range. Similar Counterstools: here – Others: here (one of my favorites! ), here, here, here, here, here & here. Cabinet Hardware – Emtek Pulls & Knobs in Satin Brass. Go bold or go home. That was our philosophy for the full overlay kitchen cabinetry, and we think it was a great idea. 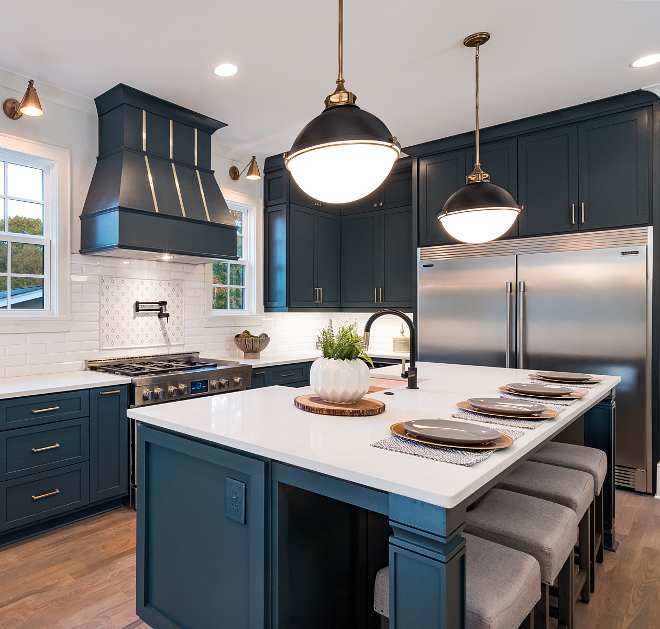 The custom navy toned color is warm and inviting, and compliments the brass hardware exceptionally. 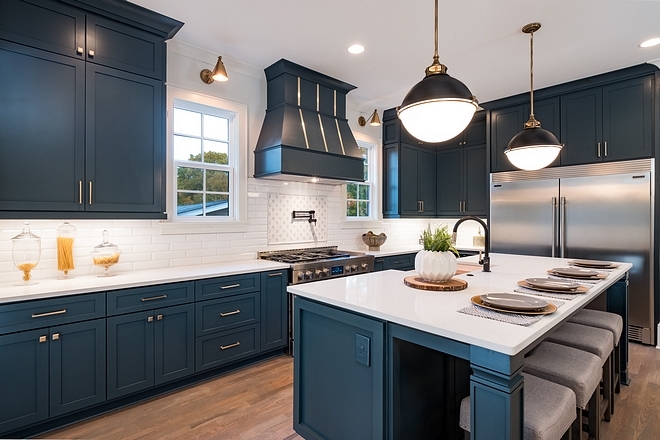 Navy cabinetry, mainly for islands, is definitely in. 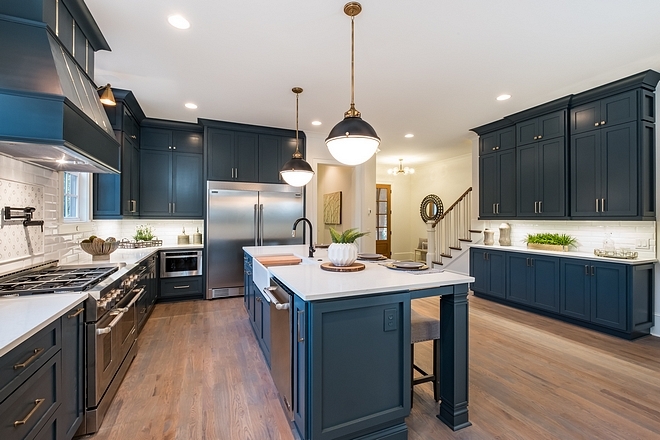 We haven’t seen too many people go for it with all navy cabinetry though. We’d love feedback! Aspen CQ quartz countertops create a crisp and clean look. The 60″ fridge is a WOW factor and conversation starter. 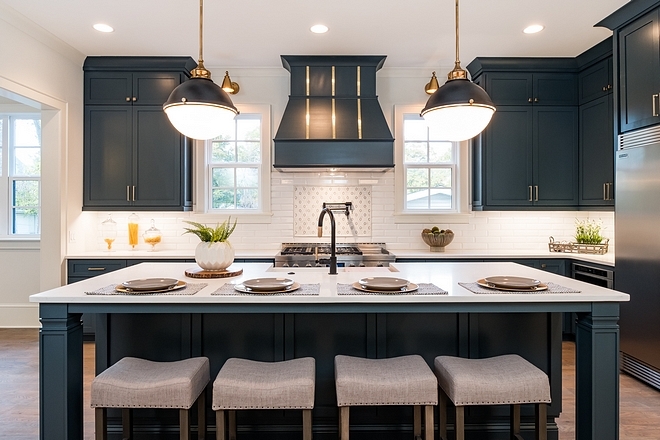 The cabinet color is custom, but similar to Benjamin Moore Hale Navy. Library Sconces- RH – similar here. 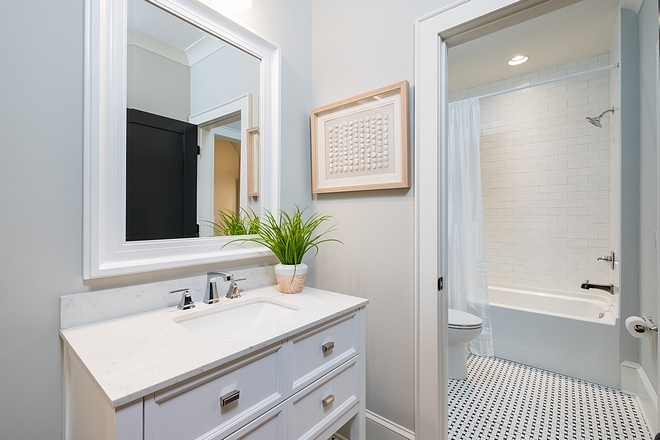 Similar Subway Tile Backsplash: here, here, here, here (matte white) & here (larger). This dining room “floats” between the kitchen and living room, but maintains its own presence thanks to the cased openings. That is always our strategy for ensuring open floor plans never feel TOO open. 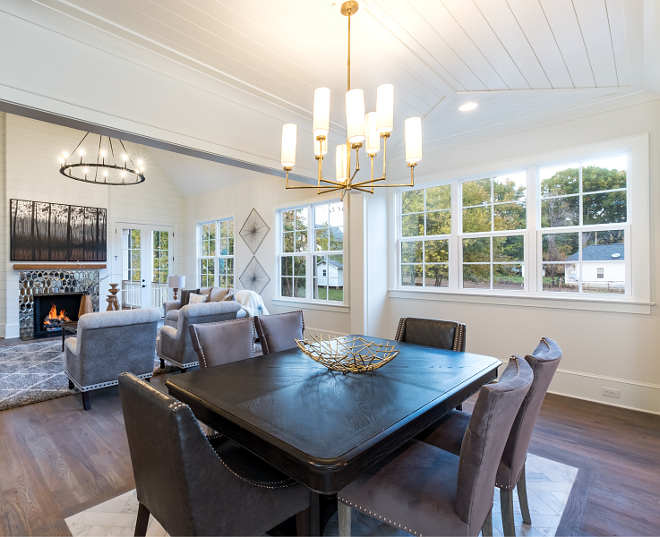 What you see below the dining table is informally known as a tile rug, and it is simply marble tile that is inset into the hardwood floor at the same level, creating the look of a rug, but maintaining the durability and functionality of tile. How cool!? Looking up, you’ll notice V-Groove trim in a unique pattern. 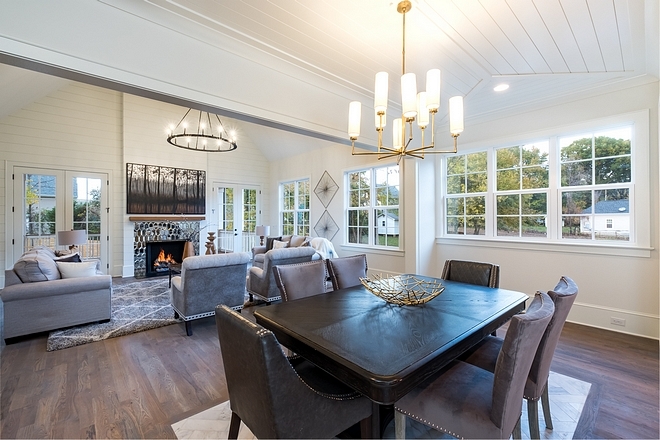 The paint color throughout this main living space is Benjamin Moore Dove Wing. Chandelier is by Visual Comfort. 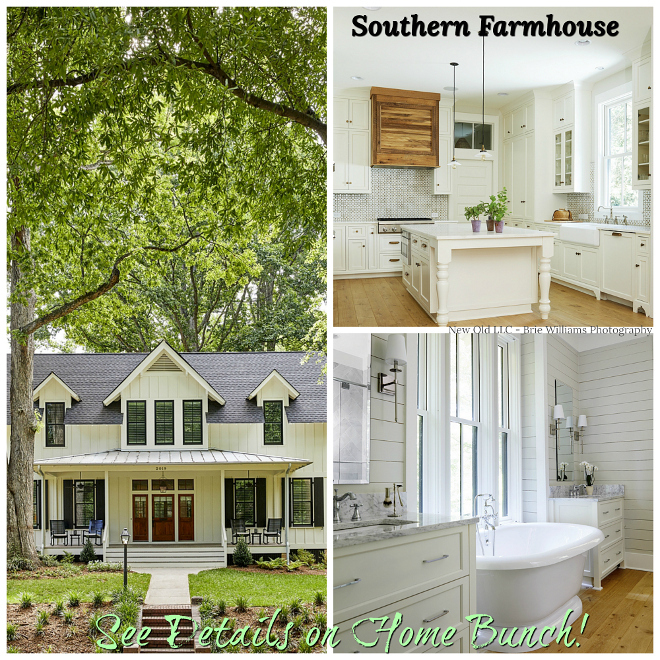 Now the Farmhouse vibes start to really kick in! With a full height shiplap accent wall it’s hard to not just sit back, relax, and take it all in. 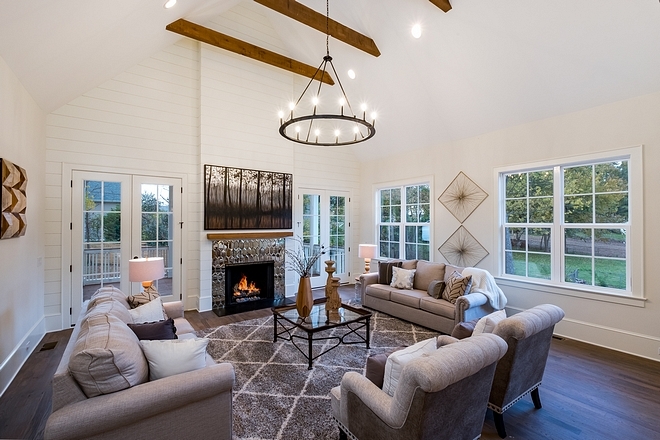 Cedar exposed beams and a matching fireplace mantle help evoke a rustic feel. The ceiling vaults to a grand scale of 20 feet, and that vault even continues outside to the covered porch. Imagine a cold morning and being able to just cuddle up on one of these two large couches with a cup of coffee and the warm fire! What could be better? The mirrored glass tiles put a spin on your typical fireplace surround! Similar Accent Chairs: here & here. 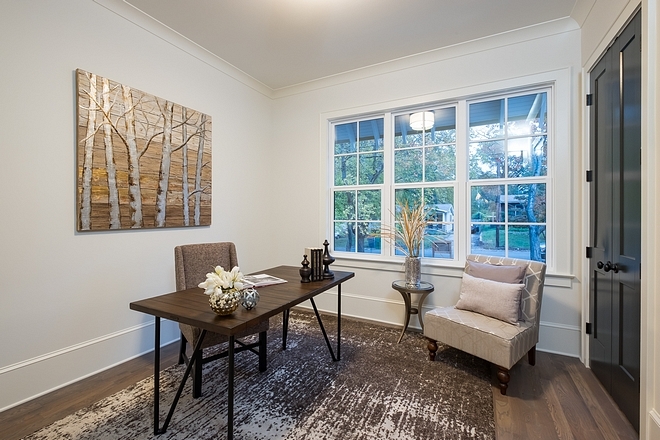 Get some work done or just take in the outdoors through the large triple window. This room would also function well as a guest suite, kids playroom, etc. The doors throughout the home are all painted in Benjamin Moore Iron Ore as you see to the right in this photo. We do this to create some visual interest and keep things exciting in an era of neutral colors. Paint color in this room is also Benjamin Moore Dove Wing. Who wouldn’t want to be a guest with this bathroom!? 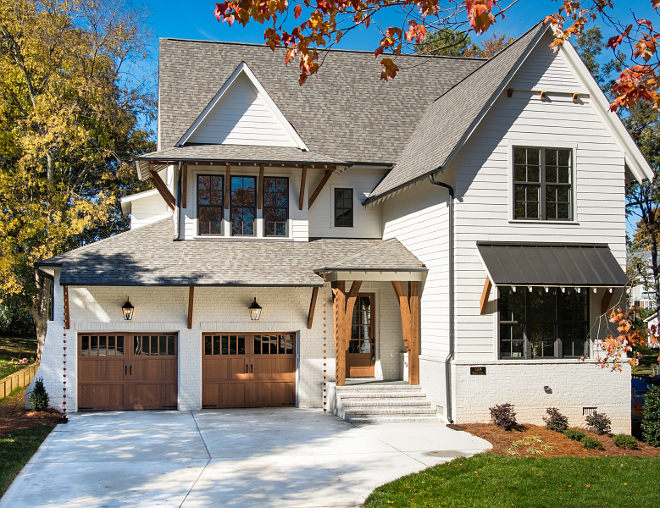 We wanted to make a guest in this home feel as if they were on vacation at a tropical beach paradise, while visiting in the heart of Charlotte, NC. We didn’t want to go too far down the beach themed route, however. Finding that balance was critical and something we think was executed flawlessly. 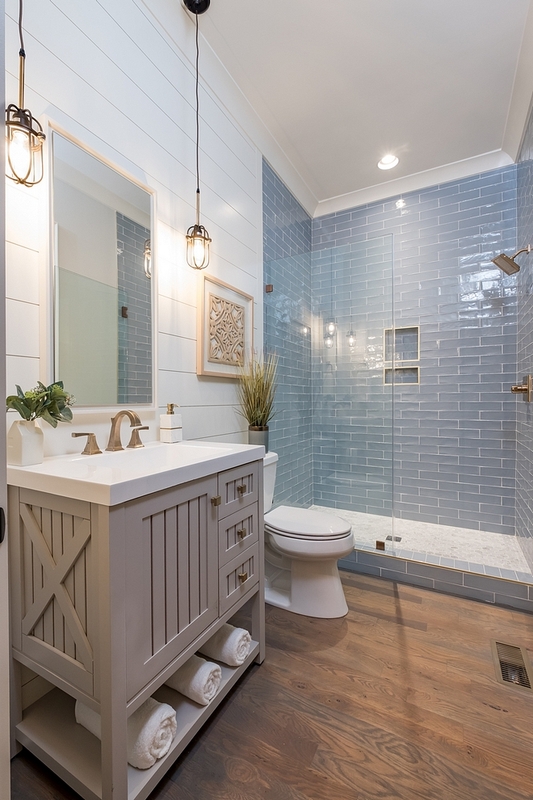 More shiplap trim was essential and contributes to the coastal feel, while the brilliant blue textured subway tile was a home run. Paired with the brass fixtures and banding, the most sophisticated visual sensation is accomplished. Who’s in love? Vanity- Martha Stewart in Sharkey Gray – similar here. Sink Faucet- Delta Dryden in Brilliance Champagne Bronze. Lights- Elk Binghampton in Oil Rubbed Bronze and Satin Brass. Shower Fixtures- Delta Dryden in Brilliance Champagne Bronze. Mirror- West Elm Floating Wood Wall Mirror. Similar Tile: Here (in silver) & Here (in grey), Here (in blue) & Here. We ensure to never skimp out on secondary bathrooms. This particular one is a Jack and Jill set up! The basket weave floor tile has a 3D look in person and is one of our favorite tile selections to date! Vanity: here – similar: here. Faucet- Delta Ashlyn in Chrome. Similar Shower Tile: here – Floor Tile: here. Similar Wall Tile & Floor Tile. What a great spot to relax and recharge your batteries. We didn’t have to do anything special in this room, but we noticed attic space was above the room, so we opted for a tray ceiling to add some dimension. A grand scale lighting fixture was necessary, so we opted for this Crate and Barrel Drum Pendant. 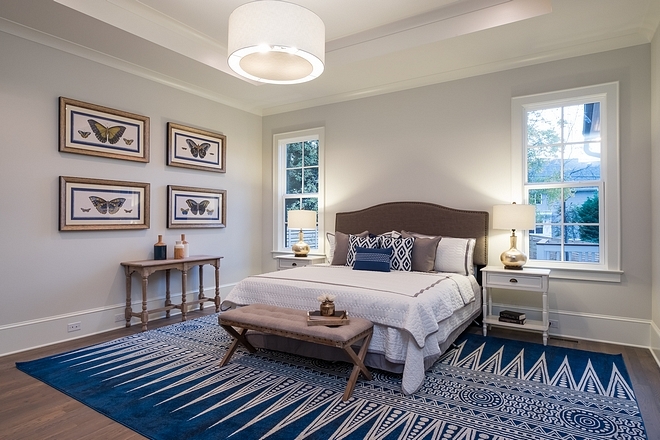 Paint Color – Benjamin Moore Halo. Rug: Here – other colors available. Similar Nightstands: Here & Here. Similar Bedding: Here & Here. Beautiful Benches: Here, Here, Here, Here, Here, Here & Here. 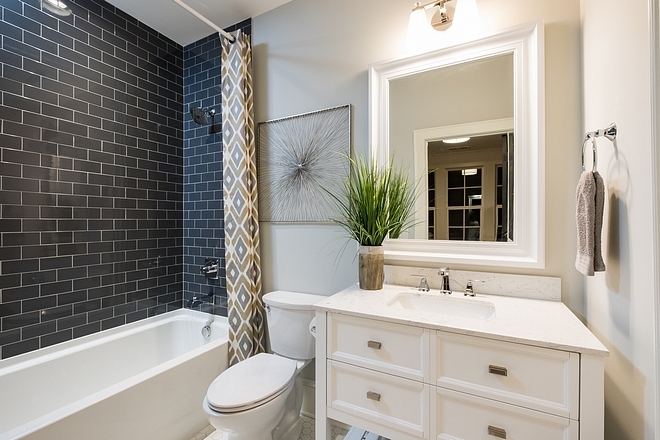 One of the places that should truly stand out in any home is the owner’s bath. It is a spot where the hard working owner’s of the home can refresh their mind and body and prepare the the new day ahead of them. With that in mind, we created what you see here and in the next photo. 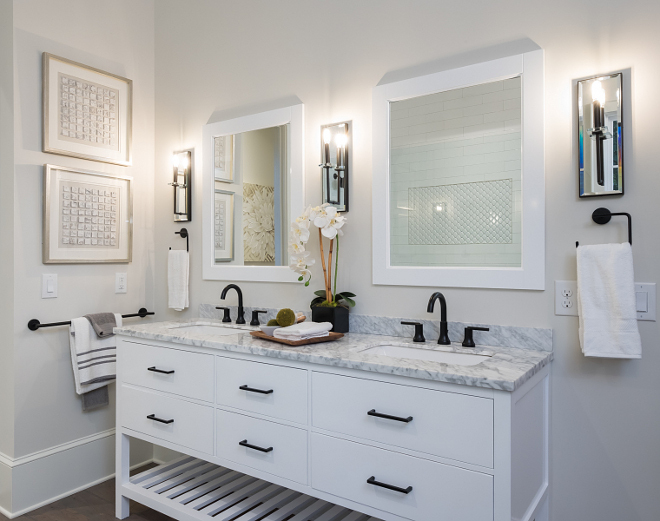 An oversized dual vanity has plentiful space for two people. 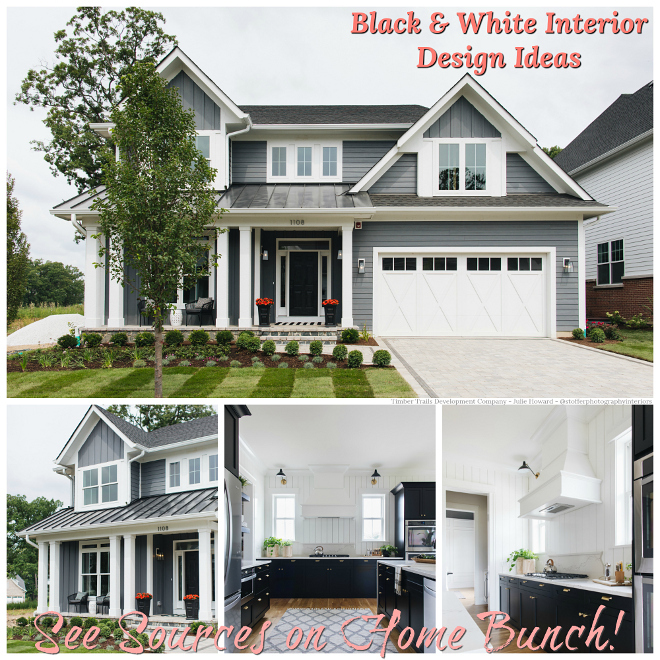 We went for the contrasting black and white color scheme to set it apart from the brass/blue throughout the rest of the main floor. Hardwood flooring was continued into the bathroom as well, meaning no cold bare feet! Vanity and Mirrors- London 72″ Double Vanity in White – Others: here, here, here, here, here, here, here & here. Faucets- Delta Trinsic in Matte Black. Whether you are a bath or shower person, we’ve got you covered! The frameless glass shower with hexagonal black and white tiled floor is begging you to take a long, hot shower. Meanwhile, the clawfoot tub with matte black feet has a glass of wine and good book awaiting you to soak away the stress of the day. Either way, you are making a great choice. 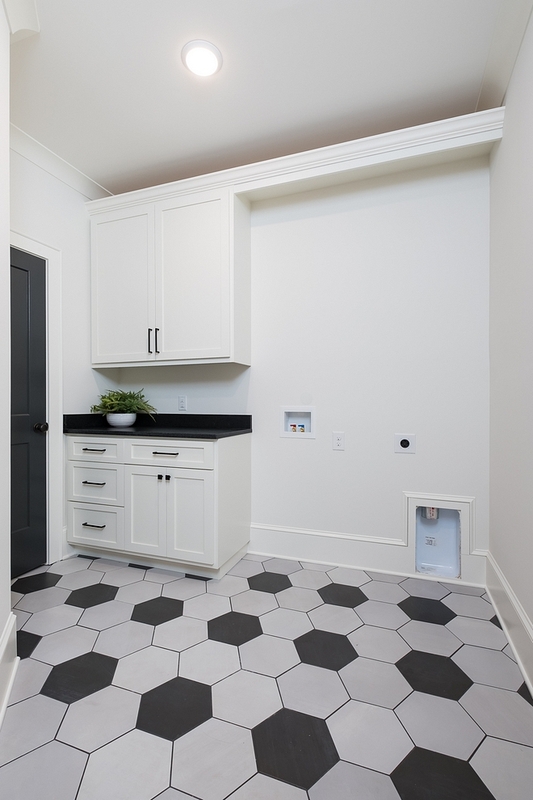 The laundry room features large hex floor tile and custom cabinetry. Paint Color is Benjamin Moore Dove Wing 960. Hardware: Pulls & Knobs in Flat Black. 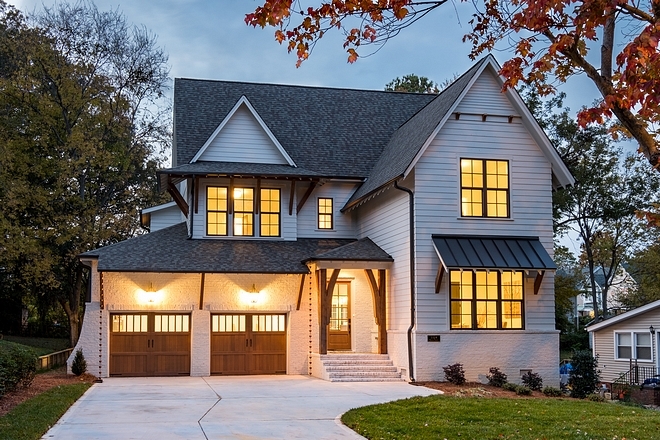 Located right off the garage, this is a convenient spot to drop your bags, throw off your coat, and get to living your best life in this amazing home. Similar Pillows: Button Pillow, Grey, White. Other Beautiful Pillows (great quality! ): here. Paint Color- Benjamin Moore Dove Wing. Trim Color- Benjamin Moore White Dove. Remember earlier when it was mentioned that the 20′ vaulted ceiling continued outside? Well here it is! This spacious outdoor living area is pre-wired for a TV and ready for comfortable furniture for enjoying the usually perfect NC weather. Stain- Benjamin Moore Hidden Valley. Many thanks to the builder (& McKay! 🙂 ) for sharing all of the details above! Serena & Lily: Shop everything 25% off with code BIGDAY – Ends 11/27! Wayfair: Cyber Monday Sale Up to 80% OFF!!! 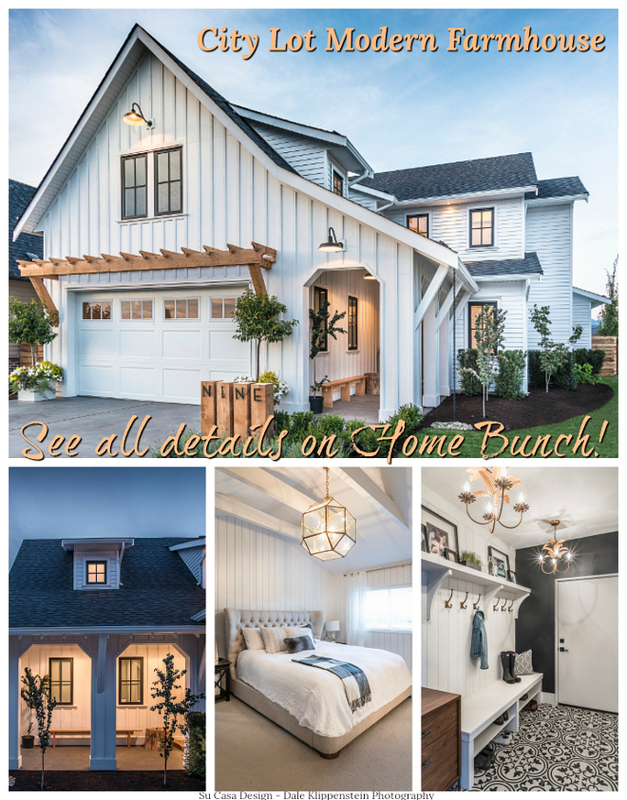 Huge Sales on Decor, Furniture & Rugs!!! Pottery Barn: Up to 75% Off Sale – Today ONLY!!! One Kings Lane: 30% Off of entire site! 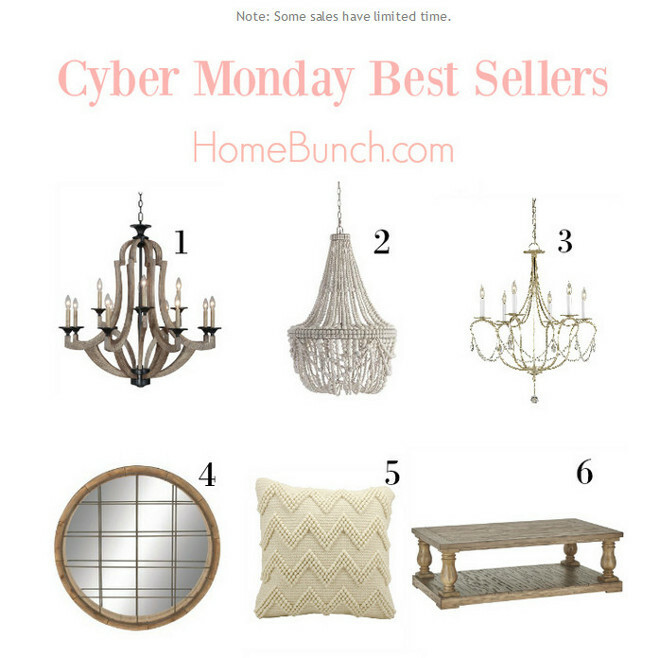 Build: Save Up to Cyber Monday Deals – Up to 80% OFF on Kitchen, Bathroom, Hardware & Lighting! Neiman Marcus: Today Only: Up to 50% Off – Take 25% off selected sale Items! Pier 1: Christmas Decor Sales + Free Shipping! Williams & Sonoma: Buy More, Save More! 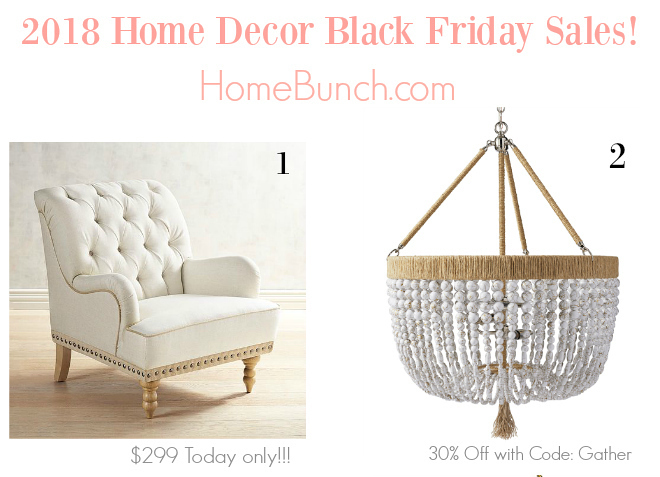 2018 Home Decor Black Friday Sales! 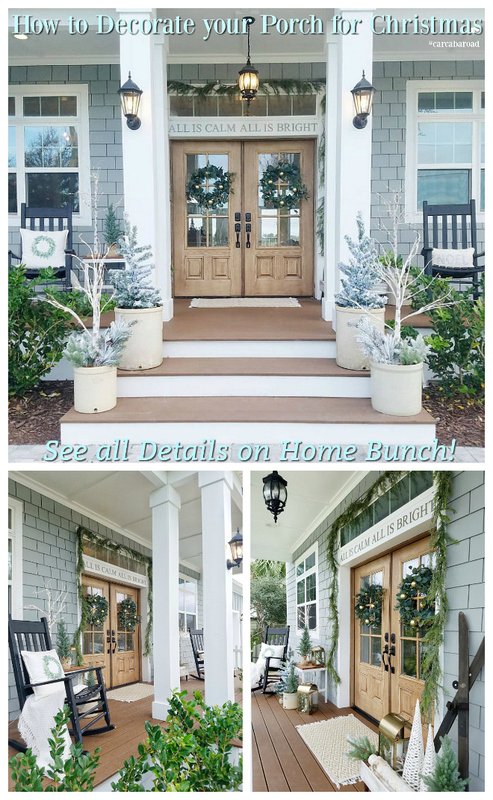 How to Decorate your Porch for Christmas. Family Home Renovation with Casual Interiors. 2018 Norton Children’s Hospital Raffle Home.